In this work, we investigate gaze selection in the context of mid-air hand gestural manipulation of 3D rigid bodies on monoscopic displays. 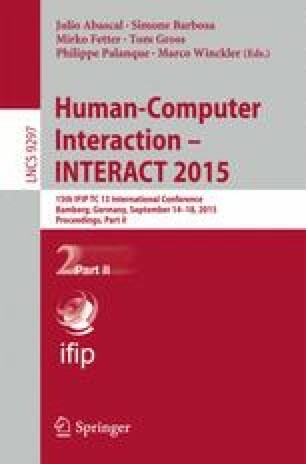 We present the results of a user study with 12 participants in which we compared the performance of Gaze, a Raycasting technique (2D Cursor) and a Virtual Hand technique (3D Cursor) to select objects in two 3D mid-air interaction tasks. Also, we compared selection confirmation times for Gaze selection when selection is followed by manipulation to when it is not. Our results show that gaze selection is faster and more preferred than 2D and 3D mid-air-controlled cursors, and is particularly well suited for tasks in which users constantly switch between several objects during the manipulation. Further, selection confirmation times are longer when selection is followed by manipulation than when it is not.